Transparent devices were dream of tech concept designer and always fantasized by people around the world. But its no more just a design or concept, here In 2014 we get out first Transparent dual screen tablet by Grippity. Hi everyone. Wish you a very happy new year 2014. This year is really going to be big blast in technology eruption and what hidden awesomeness is about to be in light. Transparent tablet and Smartphone is about to be one of leading technology. The Flash of this new amazing technology is given by worlds one of leading technology creator Grippity. 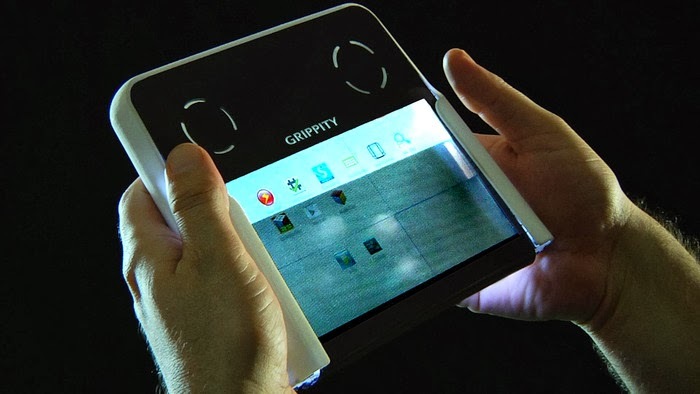 Grippity became the first ever company to launch the world’s first transparent tablet with dual screen as well. This tablet is semitransparent in display and having 7 inch of screen with display resolution of 800x480. This tablet is about to arrive in market soon. Grippity comes with built in dual sided translucent capacitive touch screen. User would be able to operate on both side and isn’t it awesome and first of its kind? This tablet runs on cortex A8 processor and operate on Latest Android 4.2.2 aka jelly bean. According to report it would be available to upgrade android as well. On the pack, it would have 4 GB of memory and it can be expanded upto 32 GB. This amazing tablet have almost all necessary connectivity option. It supports Bluetooth and Wi-fi. Along with this, It also comes with IR bluster, means you can use it as universal remote control as well. 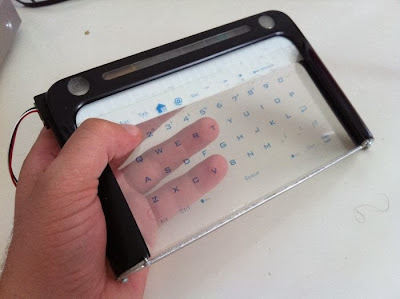 The creator of Grippity, announced and reported that, the device’s partially translucent and dual screen would allow user to type via amazing touch screen transparent keyboard. Since this device is having both screens supporting touch, user would be able to use all 10 finger to type. Its to inform that, one of the similar technology is having patent of Samsung which allow device to be typed from both side of the screen. Price of the device is not announced yet, still online report shows that its price would be around $235 and for pre order it may be around $160. 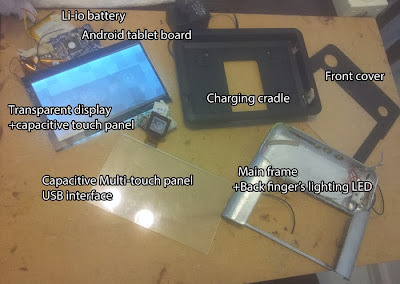 About the Project Transparent Dual Screen. This project is featured on KickStarter.com. Michael Nieto from TrendHunter says "Transparent tablets are just the next step in multi-touch devices that could make a turning point on how touch screens can be used in a new form”. Grippity is totally new look featured tablet which is supported by thousands of people around the world and its like dream coming true. Its not look like any other tablet and you can see its totally different design and solid part at the top and transparent part at bottom and mid. One of the biggest advantage Is for user with fat finger, this big screen allow you to use the expanded keyboard and really very interactive tablet ever you would use. Watch in image you can see, Transparent Screen, Main Frame back finger lighting LED, front cover capacitive multi-touch panel USB powered, Li-Ion battery and Android tablet. At the beging of the project, combination was tested and it performed awesome and you would notice really it’s simple assembly of awesomeness. According to kickstarter, Main concern was display and it took lots of assembly and disassembly for the proper design and now its on final way. A single device with awesome feature, a gaming device, a tablet, a Smartphone(could be next) and remote control. Share this awesome Stuff and amaze your friends.